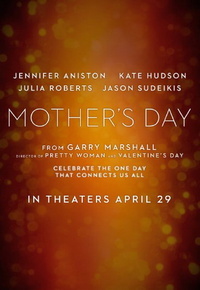 Mother's Day is a 2016 American romantic comedy film directed by Garry Marshall and written by Marshall, Tom Hines, Lily Hollander, Anya Kochoff-Romano and Matt Walker. It features an ensemble cast, led by Jennifer Aniston, Kate Hudson, Shay Mitchell, Julia Roberts, Jason Sudeikis, Timothy Olyphant, Britt Robertson, Jack Whitehall, Hctor Elizondo, and Margo Martindale. Filming began on August 18, 2015, in Atlanta, Georgia. It was released in the United States on April 29, 2016 by Open Road Films and grossed $48 million worldwide. The film is similar in format to Marshall's previous two ensemble romantic comedies with holiday themes: Valentine's Day (2010) and New Year's Eve (2011) and was the final film of his career prior to his death in July 2016. • Nick Jonas: Kate Hudson and I have "an unbelievable connection"
This webpage uses material from the Wikipedia article "Mother%27s_Day_%282016_film%29" and is licensed under the GNU Free Documentation License. Reality TV World is not responsible for any errors or omissions the Wikipedia article may contain.